For an employee, the office work space becomes your second home to do work. Therefore, to produce optimal work, your employees will be willing to organize the work space as comfortably as possible. Therefore, of course it is important enough to decorate the office to be comfortable and support your work activities. If you are looking for ways to organize office work space, it’s good to listen to the following 10 tips for a comfortable room and can increase your productivity. One of the things that often makes neck ache is the position of the computer that is lower than the position of the eye when you sit. As a result, all day long you constantly see the computer by looking down. Try to elevate the laptop to the office desk until the screen is level with your eyes. If indeed the table contained in office facilities is quite low, try to use a bluetooth keyboard that is separate from the laptop to still be able to type with the position of the hands relaxed but also the neck that is not stiff. If you work in cubicles in a closed room, try adding live plants as decorations on your table. It doesn’t need to be big and complicated to take care of, try succulent, cactus, or Chinese bamboo to put at the end of the table. Plants like succulent and cactus do have a variety of species and attractive colors, so they can brighten up your desk. Moreover, these plants do not need to be watered too much and can grow well in closed spaces. 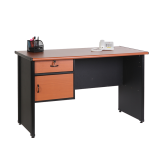 Office desk model LMK 1260L / 1275 L from Lunar Furniture is the best choice for creating your work space more comfortable and productive. Call immediately 021 54376 555/333 or click www.lunarfurniture.com for more information.